Seven people have reportedly lost their lives in a fire that engulfed a flat in Asante Mampong area of Ghana. 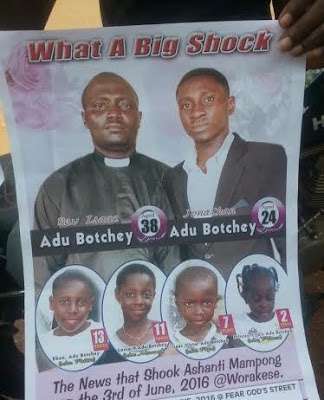 The seven victims reportedly include a man identified as, Mr Adu Botchey, as well as his five children and a visitor, who lost their lives when the fire engulfed the flat with house number W.297 at Worakese, a surburb of Asante Mampong, Ghana, on Friday, June 3, 2016. The victims are reported to have been trapped inside the house by the burglary proofing in the house, with neighbours unable to launch a rescue mission. The Landlady, Madam Elizabeth Amoah, disclosed that at about 12:30am on that fateful day, people had been heard shouting that one of the flats in the compound was on fire. 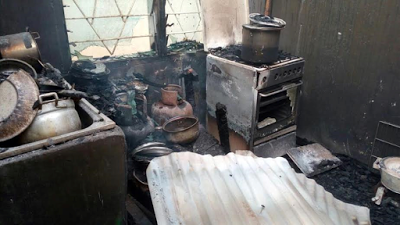 Mrs Amoah had woken up to discover that the three bedroom flat occupied by the late resident, Mr Adu Botchey, an Estate Officer at Obuasi, his five children and a guest, were on fire. The fire service from Mampong and Ejura had immediately been but but were unable to save the lives of the victims by the time they were done battling the raging fire. The cause of the fire is yet to be ascertained or revealed. The bodies of the victims have reportedly been deposited at Mampong District hospital mortuary for autopsy. The deceased are to be buried on Monday, June 6, 2016. May their souls rest in peace.